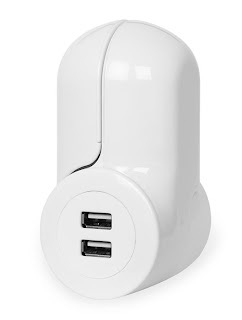 Until USB wall sockets become standard in homes, I'm still on the hunt for visually appealing ways to plug in our devices in common areas of the house. Between hubby and I, we have enough devices to compete for all the available outlets. 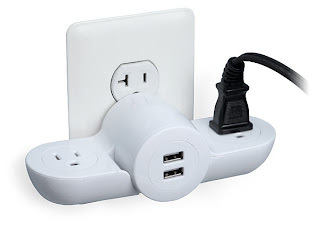 2 standard plugs, 2 USB plugs. Fold it up when not in use. Boom! How much do I love this?? In case the name sounds familiar, I've written about Pivot before: the Pivot Bendy Power Bar was originally a concept featured on Quirky, a crowdfunding site just like KickStarter. (Quirky came first, just so you know. If you don't remember Quirky, I've featured other great products, including this Solar Charger and these insanely smart Crafty Caps.) The Pivot Power Mini was another crowd-funded Quirky project, raising over $3Million and is now available on a host of websites including ThinkGeek. It's great to see these crowd-sourced products garner so much success. I even saw the Pivot Bendy Power Bar at Bed, Bath & Beyond a few months ago.